These brioche's are all over the internet at the moment, so I thought I had to have a go too! There are quite a few recipes around but I actually quite liked following the video recipe by Titli. I love her recipes and have followed a few before which have worked out well. The photos are actually from the brioche my daughter made a few days after my first attempt. Start by putting the sugar and the yeast into the milk and whisk them together. Leave for 10 minutes for the yeast to activate. But the flower, salt and lemon rind into a mixing bowl and mix well. Place a well into the middle of the mixing bowl and add the melted butter, eggs, and the yeast and milk mixture. Mix all together into a nice soft dough. Once the dough has been made you need to knead well for about 10 minutes. Pop the dough into a greased bowl and cover. Allow to rise between 1 to 1 and a half hours - .until dough has doubled in size. Remove from bowl and knead again for about another 3-4 minutes. Split the dough into 4 pieces of equal size and shape them into round balls. Take one piece and roll out into a circle shape until about 3mm thick which is about 10 inches diameter. Lift and place onto some baking paper. 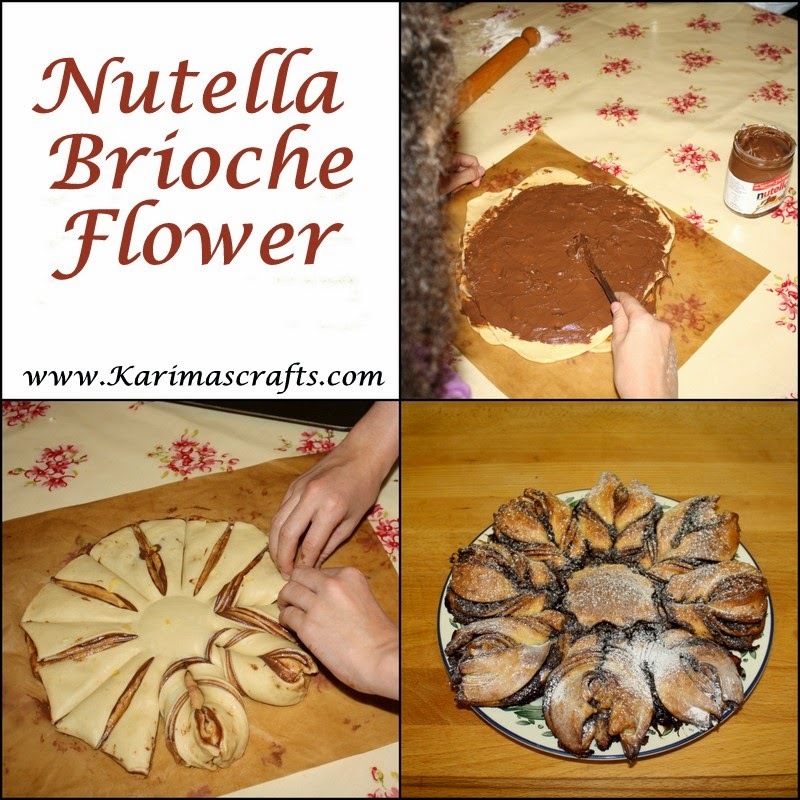 Then take your Nutella and spread a layer of Nutella all over the piece of rolled out dough, leaving a slight edge. Then take the second piece of dough and roll out as before and then place onto the first layer of dough and chocolate. Then spread a layer of chocolate onto this second layer. Then take the third piece of dough and roll out as before and then place onto the second layer of dough and chocolate. Then spread a layer of chocolate onto this third layer. Then take the last piece of dough and roll out as before and place onto the third layer of dough and chocolate. Cut around the edges making them all similar and removing excess dough. Then you need to place a glass into the centre of the pile of dough. Then with a sharp knife you need to cut into 16 equal pieces. Start by cutting one slice then cutting on the opposite side if the glass. Then cutting half way between those two point so you have 4 cuts. Then cut into the half of each of those cuts. Then cut into half of the 8 cuts so you have 18 pieces. The take hold of two pieces of the 18. Twist outwards once, then twist outwards twice and then twist a half twist to bring the ends together. Repeat with the rest of the dough until all twisted. Lift the baking paper and place the dough and the paper onto a tray. Then wrap the dough in plastic and allow it to rise for between 1 and 2 hours. Once it has risen it is good to brush the flower with a glaze mixture of 1 tablespoon of milk and one tablespoon of water. Place into the oven for 20-25 minutes at 180 Degrees. Allow to cool and then you can finish by dusting lightly with icing sugar. I am dying to try this but I know it will be the ugliest thing lol.